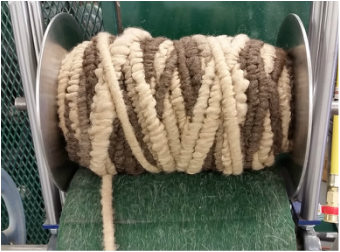 We are now excited to offer Core-spun Rug Yarn in our line of Round Barn Fiber products! Core-spun Rug yarn is a super-bulky yarn made by our Core-spun Rug Yarn Maker. This nifty machine basically wraps roving around a core as it comes from the carding machine, resulting in a super-thick novelty yarn. At this time, we are using a 100% thick cotton core for all of our core-spun yarn. As the product’s name suggests, the primary intention of Core-spun Rug Yarn is for weaving rugs, and it’s great for that! However, it is also a fun yarn for quick projects done on oversized knitting or crochet needles, oversized knitting looms like the new KB Zippy Loom, and even arm knitting! Gigantic yarns are all the rage right now, so now is a great time to consider having some of your fiber processed into Core-spun! Core-spun yarn can be made from many different fibers: wool, alpaca, llama, etc. It is even a great option for fiber that otherwise might be unsuitable for traditional spun yarn. For instance, many of our customers use their alpaca “seconds” for this very marketable product. Likewise, fiber that is too short or too weak for traditional yarn can make awesome core-spun!